Vintage plastic Renwal Speed King toy car. 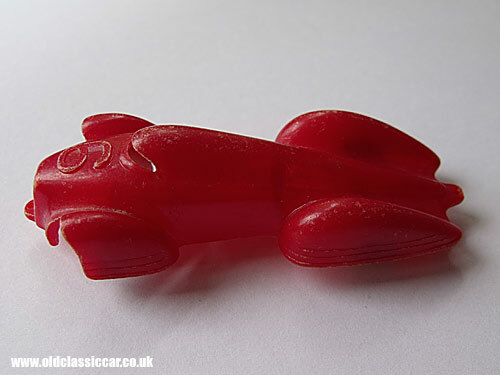 A number of toys echoing the style of pre-war land speed record cars have been sold over the years, some intricate and detailed, others, like this plastic Renwal toy car, stylish yet very simple. Renwal was an American maker of plastic toys, and the car shown above was one of two similar toys labelled as the Speed King racer. The larger version measured 4.5" in length, whereas this version measured just 3.25". The streamlined bodywork is a simple plastic moulding, into which two metal axles - fitted with white plastic wheels - are installed. The smaller car wore racing number "6", whereas the larger one was number "88". I think it dates to the late 1940s or early 1950s, although is very much '30s in its styling. To see a similar plastic toy racer, have a look at this Marquis Toys car from Australia. In appearance it's very reminiscent of the Dinky Auto Unions produced either side of WW2, although they were die-case metal rather than plastic.